On April 21, Lincoln Center Theater raised a banner over the faade of the Vivian Beaumont Theater, heralding their hit production of SOUTH PACIFIC. Directed by Bartlett Sher and starring Kelli O'Hara and Paulo Szot, SOUTH PACIFIC is now playing at the Beaumont in an open-ended production, and was nominated for eight Outer Critics Circle Awards including Best Musical Revival. 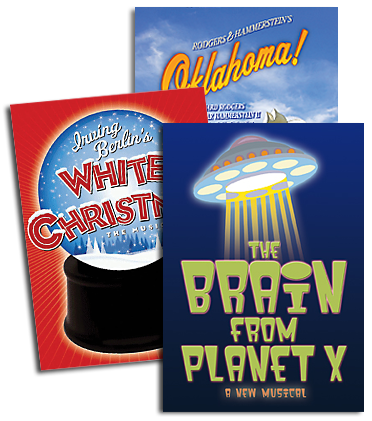 Visit www.southpacificmusical.com for further information. Photo Courtesy of Lincoln Center Theater. If you are in the vicinity of Lexington Avenue and 59th Street in Manhattan between Thursday, April 24, and Sunday, April 27, check out the six Bloomingdales windows which face Lexington Avenue. They are devoted to Rodgers & Hammerstein's SOUTH PACIFIC and one of them is a tribute to Catherine Zuber's designs, featuring her original costume sketches.